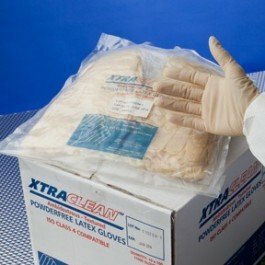 View More In Cleanroom Gloves. XtraCleanTM Latex Gloves, Hand Specific, Beaded cuff, Textured Surface, Powder-Free, Class 100 Cleaned, Packed 50 Right / 50 Left Hands per Master Bag, 4 Master Bags per case (200 pair). Cousin to the XC1001 and XC1002 XtraClean Series gloves, these hand specfic latex gloves are 12" in length, powder-free, and are available in half-sizes 6 through 9, plus a size 10. They are packaged and processed in ISO Class 4 operating conditions and come 1 pair per pouch, 10 pouches per bag and 20 bags per case or 200 pair per case. Textured palms and fingers allow for high tactile sensitivity and an excellent grip in wet or dry conditions.